Sub: School Education- SCERT, A.P- NUEPA- Head masters Capacity building Training programme in Andhra Pradesh in all the districts from December, in six spells for 5 days for each spell - instructions issued - Reg. Ref: : Rc.No.5101/AWP&B/5.1/5.7/RMSA/2017 of the CSE and Ex-officio Director RMSA, A.P.,Amaravathi. Therefore all the DEOs in the State of Andhra Pradesh are requested to identify the Head Masters (50) of High Schools of their respective district and depute them with instructions to attend for the said training programme as shown in the above table in 6 spells for 5 days each. i).To report by 9.00 AM to the Course Coordinator Smt. V.Vijaya Durga, SCERT, A.P. 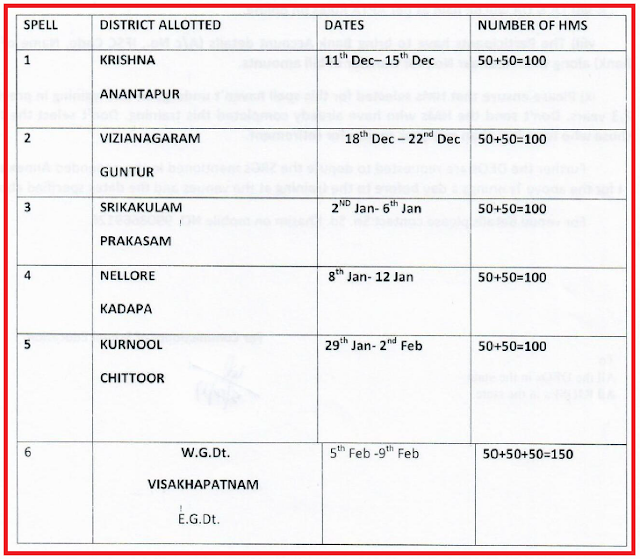 cell no 9866571213.
iii) Send the list of HMs selected for training by 5th December without fail. Please send the details of HMs like their Joining date, Retirement dates, Service completed, date of joining in the present cadre etc promptly along with the list. iv) Ensure to attend 100% on time on first day as per spell wise schedule. v) 40% Head Mistresses are to be selected in each District. vi) Only Regular HMs of ZP, Government, Municipal and KGBVs who haven’t undergone this training are to be relieved. vii) TA & DA will be paid as per APTA Rules on online. viii) The Participants have to bring Bank Account details (A/c No., IFSC Code, Name of the Bank) along with Aadhaar No., for transfer of bill amounts. ix) Please ensure that HMs selected for this spell haven’t undergone this training in previous 2,3 years. Don’t send the HM5 who have already completed this training. Don’t select the HMs those who have less than one year service for retirement. Further the DEOs are requested to depute the SRGs mentioned in the appended Annexure —I for the above Trainings a day before to the training at the venues and the dates specified above. All RJDSEs in the state.